Home MusicThe BGM that plays when this summon's art is displayed on the Home Page. 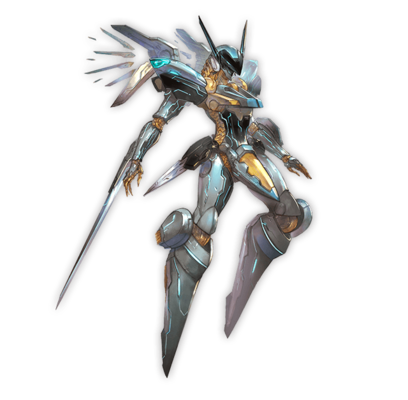 A powerful Orbital Frame made from advanced technology utilizing the multipurpose material known as Metatron. Thanks to its numerous armaments, its battle parameters are off the charts, but even more impressive is its ability to compress space and travel short distances instantaneously, an ability called Zero Shift. Additionally it's equipped with the combat AI ADA, a technology that far outclasses other combat AI systems. 7-hit Light damage to random foes. Duration: 3 turns. 3T3-turn cooldown at the start of battle. 9T9 turn cooldown. This summon is 3★ uncapped when obtained. Cannot be sold for rupies, reduced or used for upgrading. Upon using its call, changes the BGM to Beyond the Bounds. Has no effect on gameplay. BGM changing upon call can be toggled in the summon details page. The call's damage is based on the ATK of the Main Character. and DMG Cap Up effects from other sources present on the Main Character.